Anna Butler in Ward 7 is the first Solar for All qualified participant of the 51st State Solar Co-op to install her solar system! Solar United Neighbors has helped more than 500 D.C. homes go solar over the past decade—but none like this. 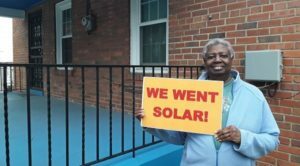 Last week in Ward 7, the first low-income household qualified for the District’s Solar for All program installed a solar system through the 51st State Solar Co-op. This is the first solar co-op aimed at expanding the benefits of going solar to qualified low- and moderate-income (LMI) households across the District, who will be eligible to receive a grant that pays for their solar installation. Solar United Neighbors will be supporting the installation of up to 215 solar systems on LMI homes through the 51st State Solar Co-op over the next year. 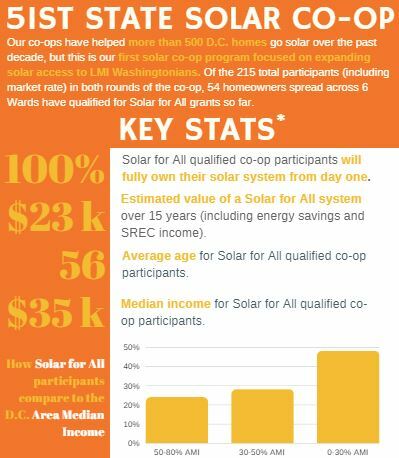 The 51st State Solar Co-op, which currently includes more than 215 market-rate and LMI participants over two signup rounds, is a project funded by Solar for All, a program of the District of Columbia’s Department of Energy and Environment (DOEE) that seeks to provide the benefits of solar electricity to 100,000 low-income households and reduce their energy bills by 50% by 2032. The program, which was established by the Renewable Portfolio Standard (RPS) Expansion Amendment Act of 2016, is funded by the Renewable Energy Development Fund (REDF). Solar United Neighbors is one of two grantees working with single-family homeowners and tenants through the program. For more information about Solar for All visit: http://doee.dc.gov/solarforall. Eligible income-qualified D.C. residents can install and fully own a solar system that cuts their electric bill in half through the program with DOEE grant funding and the sale of five years’ worth of the Solar Renewable Energy Credits (SRECs) generated by the system. Solar United Neighbors has partnered with the DC Sustainable Energy Utility (DCSEU) to deliver solar PV systems to more income-qualified households. The DCSEU, an organization that helps District residents and businesses use less energy and save money, has developed a unique way to monetize the solar renewable energy credits (SRECs) on behalf of the income-qualified households that SUN is serving. Monetizing these SRECs provides additional funding that allows SUN to install more generating capacity and serve more District residents. “The DCSEU is proud to partner with Solar United Neighbors and bring this new way of leveraging SRECs to the table to serve more income-qualified DC residents and help them save money on energy costs,” said Ted Trabue, Managing Director of the DCSEU. The co-op will focus on expanding access to solar for low- and moderate-income households, but is open to all District homeowners, no matter their income or neighborhood. For more information, please visit the 51st State Solar Co-op landing page.